It’s almost Halloween time guys! And nothing says Halloween like SUGAR! But everyone is so used to just grabbing a couple overpriced bags of the same ol’ candy every year. I say, change it up a little!!! I found these cuties on I Wash You Dry. She made a few other Halloween style pops as well but the bats really were the most adorable to me. And they are so simple. If you have kids, these would be an awesome little project for them to do. I say this not because I have children, I do not, but because I’m a child at heart and had a good time making these little guys. Small number of ingredients and tons of fun. 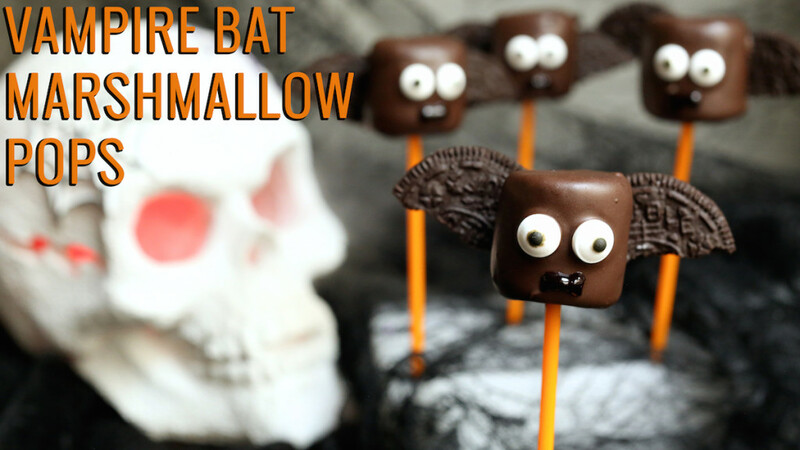 Perfect for any Halloween party or maybe a kids school event. So have fun with your kids or let your inner kid out and get to making some Halloween magic! Open up a couple Oreo cookies and remove icing (by removing, I mean eat;-)). Using a sharp knife, cut both sides of the oreo cookie in half and set aside. Melt chocolate in microwave (or on stove) according to package instructions. Poke a lollipop stick through a marshmallow almost to the top. Dip the marshmallow into the melted chocolate and spin around to make sure all of the marshmallow is covered. Knock off excess chocolate by tapping the lollipop stick on the edge of mug/bowl. Take two cut halves of the oreo cookie and place them almost tip to tip but slanted up, top of cookie up, beside each other like wings. Place the dipped marshmallow on top of the oreo cookie halves. Put two candy eyeballs on next. Now let cool (I placed mine in the refrigerator for 15-20 min. to harden up the chocolate). 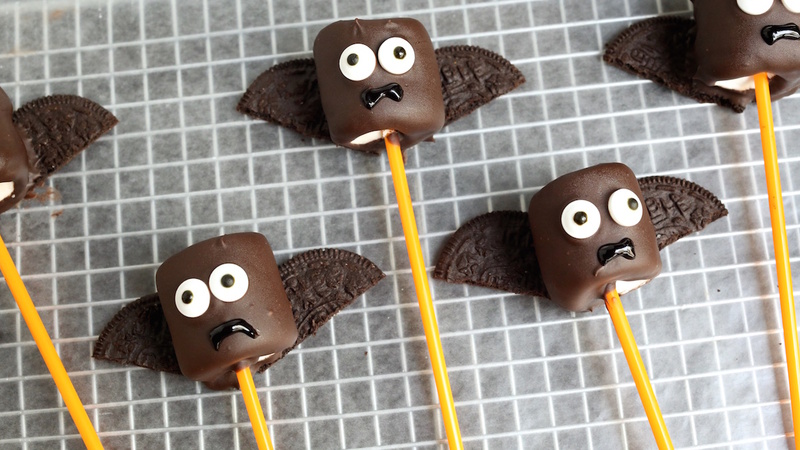 Once hardened, take the black gel icing and make a little line across, drawing downwards on both sides to make fangs. Oh my goodness these are just too cute! Now I’m excited for Halloween! 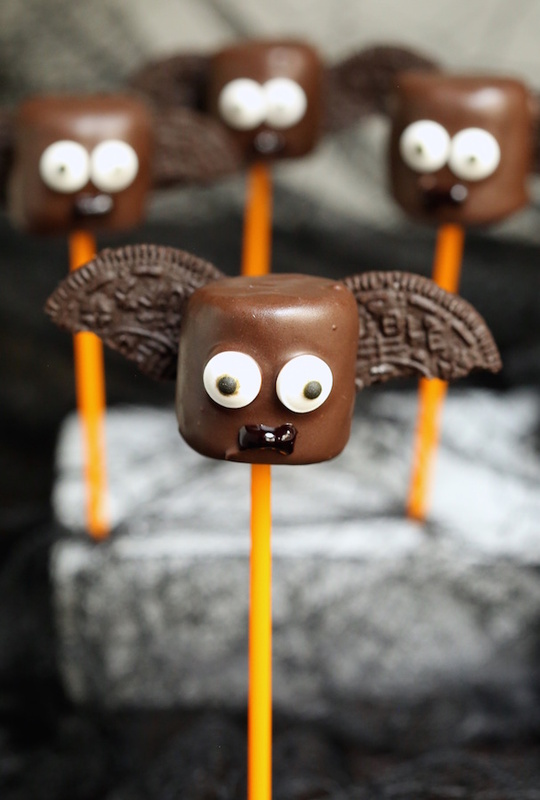 As for the chocolate- I would say 1 cup of chocolate would make 10 marshmallow pops, possibly more if you make the marshmallow pops with a thin coat.